Hands up how many of you have beards? Based on my observations over the past few years there are two manly things that seem to have become very popular amongst the guys… The first is tattoos – everyone has one these days. The second is beards. I don’t have one myself as, due to my hair colour I am afraid I will just look a little too much like Santa Claus – and that would only really be if old Saint Nick only had a patchy, holey half beard. For this reason, I had never really discussed essential oils for beards on this site… however a conversation on a camping trip on the weekend changed all that. As you can probably tell by now, a lot of the inspiration for my posts comes from life around me, my wife, children and our lifestyle. This is no different. To cut a very long story short – beer was involved after all – we spent a good hour discussing how itchy Steve’s beard was after a swim in the surf. 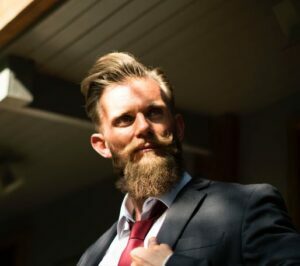 Those with beards – who I think just wait for an opportunity to discuss theirs – quickly jumped in in agreement on how dry they become this time of year in the surf and sand. “No way, Lavender smells girly” – obviously he studied the Man Versus Oils science of allocating manliness categorisations to oils based purely on how they smell. Rather not go through all that fuss? In my previous post in regards to getting started with oils, I did mention a few that were good for the hair and skin, so I simply started there. And in keeping with the theme of cost effective uses of oils, I have split my findings into two categories, the first being beard oils that are found in the starter pack. The second category is for those of you who may have access to a few different oil types. I have attempted in both cases to keep the aromas manly however it would appear that flowers are really good for the hair so in some cases beggars can’t be choosers I guess. Grapeseed oil – Hair Growth – Rich in vitamins C, D and E which are all critical to hair growth. The vitamin E content in particular helps build the hair tissue. It is also rich in linoleic acid which also promotes hair growth. The main advantage of grapeseed oil is that it is not as “oily” as the others so it doesn’t leave the beard feeling greasy. Jojoba oil – Dry skin – If your beard and face is particluarly dry, then I would go for jojoba oil due to its ability to mimic the skin’s natural oil, sebum. It is not proven to increase hair growth or reduce hair loss however it is extremely effective in treating dry skin and beardruff issues. It also contains high levels of vitamins A, D and E.
Avocado oil – Irritated skin – If dry, irritated skin is your problem, try Avocado oil. It contains many antioxidants and anti-inflammatory agents to assist in skin care and is used extensively to assist with dry and cracked skin. This one may however leave your beard feeling oily. Coconut oil – Good alrounder – I have left this one to last but, to be honest, being the most commonly found type of oil in many homes, if you have it use it. It is a natural moituriser and contains many of the nourishing attributes on the others listed here. It is high in lauric acid making it able to penetrate your skin more effectively. It shouldn’t make your beard greasy but I have found it to be so if I have it in my hair. It does have a more distinct aroma than the others as well. I use it in my shaving cream so as I said, if it is what you have, and you like the feeling of it in your beard, give it a whirl! Lavender: Not the manliest of smells but is a well-known agent in assisting with skin infections due to its antimicrobial properties. It is also commonly used as a natural dandruff remover and to aid hair growth. I would suggest using this one with jojoba to keep your face nice and moist and free from the dreaded beardruff. 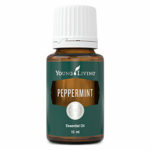 Peppermint: Use this with grapeseed oil to promote hair growth. The menthol properties will also sooth the skin however as peppermint is a ‘hot’ oil, I would highly recommend starting on the 1 drop at a time addition of the oil until it feels right. Lemon: So far we have discussed ways to make the beard and skin underneath more moist. However, if you are one that suffers from an extra oily beard, add lemon essential oil to some jojoba oil to remove the oil without drying out your skin or facial hair. Again, watch the amount that you add and you will be all good and oil free. Note: Lemon Essential Oil is particularly photosensitive meaning that if use this on your beard then go out in the sun, you may find that it sun bleaches the hair colour. Bergamot: This is an extremely popular oils for beard care due to its manly aroma and extremely effective antibacterial and anti-inflammatory qualities. Mix it with Avocado oil for irritated or split skin. Oh, and if your beard suffers from a bit of that ‘old man smell’, Bergamot is also a very good odour neutralizer. 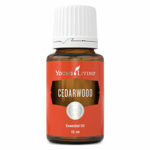 Cedarwood: Extremely popular for use in all things manly due to its rich aroma. It is however also very effective for use in beard care due to its abilities to stimulate hair follicles and increase circulation. 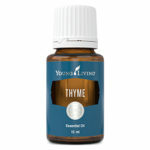 Add this one to Grapeseed oil if you are looking to thicken things up a little. Eucalyptus: Whilst the strength of the scent of this oil can be overpowering if a lot is used – I would go the one drop method for this one – Eucalyptus is extremely good for hair care due to its abilities to enhance hair growth. It does this by reducing any inflammation on the scalp and stimulating blood circulation around the follicles. Again, grapeseed oil would be suit this one. Pine: Similar in properties to Cedarwood but if you have a particularly itchy beard, Pine is your guy! Patchouli: Smelly beard? Get this one on ya face. It is well-known to eliminate odour as well as containing very good anti-bacterial properties which means it can get to the root of the most common cause of beard odour. Use this one with coconut oil. Rosemary and Thyme: I have listed these together as they are both quite similar in their attributes in regards to hair growth and their aromas – however I am probably being kind if I say that they can take some getting used to. If you have a patchy, scraggly beard and can stand the odour – use this above all others with some grapeseed oil. 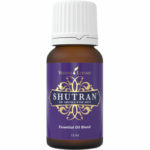 Shutran: This last one is a Young Living blend that has been created specifically for manly face and hair care. It contains Idaho Blue Spruce, Ocotea, Ylang Ylang, Hinoki, Coriander, Davana, Lavender, Cedarwood, Lemon, Northern Lights Black Spruce with quite a strong, manly aroma. If you have it, you could do worse than adding it to a good carrier oil of your choice and oiling that beard up real nice. 3 drops Copaiba (a natural muscle soother). This one will keep the beard oil free and fresh as well as provide relief to any shaving rash on the neck. This one gives a real good manly aroma adding the proven skin care capabilities of Tea Tree and Black Pepper’s antioxidant qualities to the Cedarwood and Peppermint benefits already listed above. All of the odour eating oils in one spot – not to mention their moisturising and skin care capabilities. Add a little Juniper for the antiseptic qualities required to keep odours at bay and you will smell like the country has eaten you up and spat you out! This essential oil recipe can be used daily for faster beard growth. You might want to experiment a little with the aromas as there are a few strong ones here but, with all of the follicle and hair stimulating oils in one place, this one will have you tripping over your own facial hair in no time. 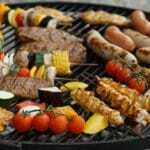 Most recipes will outline the number of drops per tablespoon or measure of carrier oil. 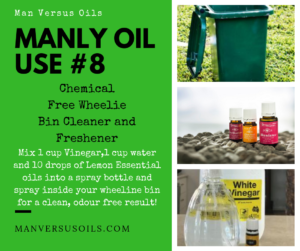 I would use this as a guide only – some even recommend adding the oil one drop at a time until you are happy with the scent or there is no irritation. This is something I highly recommend for the stronger oils such as Peppermint, Lemon, Eucalyptus and also for Rosemary and Thyme (but that is just so the smell doesn’t make you well up in man-tears). Measure 2 tablespoons of your chosen carrier oil and transfer to the amber bottle. Add required drops (as per preference) of the essential oil of your choice. Every night massage the oil mix into your beard. Wash it off with a natural beard shampoo the next morning. Ok, here are some pre-made ones you can purchase – just cos I am nice and know how man-busy you may be! Phew… for someone without a beard, that was a lot longer than I expected. I am a mansperimentalist at heart however so I will be taking some of these mixes up to my bearded camp buddies and will of course report back in due course. Alternatively if you have any mixtures you like to use, please comment below and I will add them to this post. Among all carrier oil, the one that I have used the most is coconut oil, it saved my beards from itching when I still keep beards as teenager.Beards makes a man look manly, same as muscles and physical appearances. 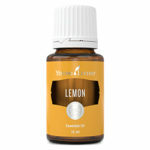 I think you are right about the lemon essential oil, nobody want that kind of effect. Hi Paul! Reading about your article on beards got me laughing out loud. My cousin who keeps beard has had the experience of itching. I will direct him to your site to read this great article. I believe the Laveder bead oil will be great for him because as you rightly said, it will keep the dry bead moist.Thanks for writing a review on this topic, it will surely help Team Gang Beard. Thanks. 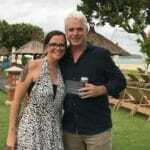 Hi Gracen, haha – let me know how he goes. Hair oil is very good though someone like me I barely used hair oils because I actually have natural skin oil and hair oil. The part I will like to improve about myself as regards my hair is my beards hairs. Some parts of my side beards looks a little scanty And I have been thinking ways to improve it. I don’t know the very combination to use.